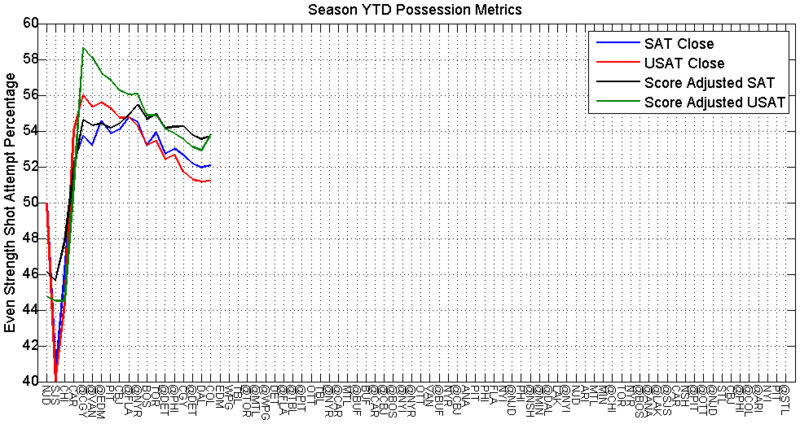 So the Caps are just about a quarter of the way through their season and we’ve seen some good and some less than good in both the results and the process. 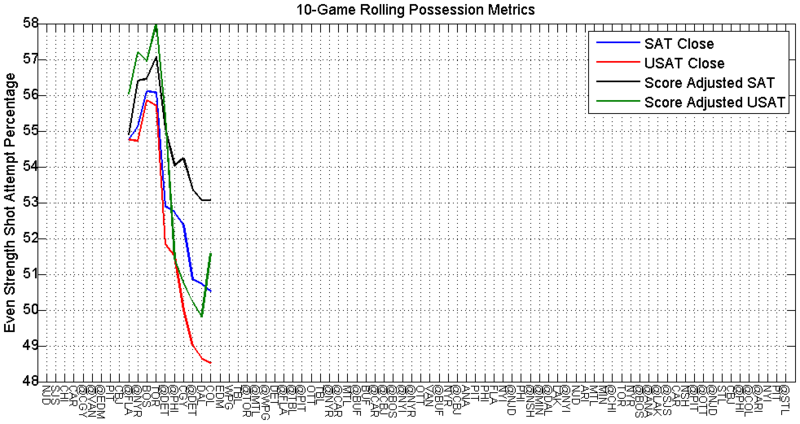 I know the win last night may make most Caps fans happy, but there’s been a few troubling trends over the last several games. I think the Caps can be better than they have been. Of course I’m only basing that assumption off of the games earlier in the season; but I guess we should start to take a look at what’s working and what’s not working. Not a whole lot of streaking in any particular direction here. 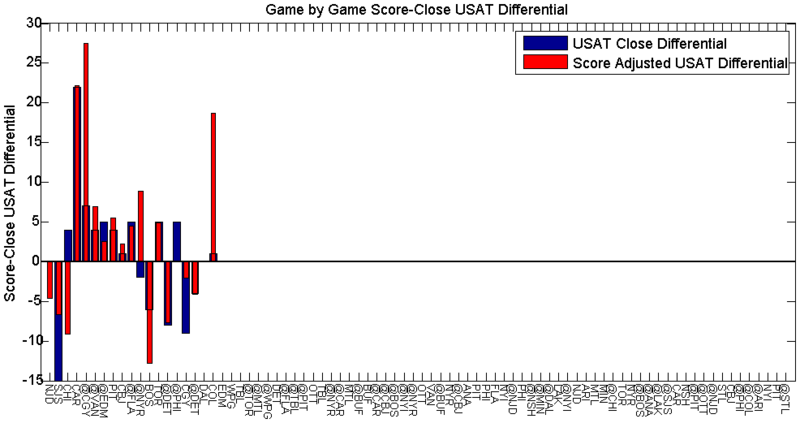 However, they have had a casual improvement in their pace since I last looked at their performance (at game 11 – so 8 games ago). This is good on the whole, since it’s not really like they’ve had the benefit of any particular PDO benders, unlike the Rangers who seem to be in a perpetual PDO bender. Thanks Hank. 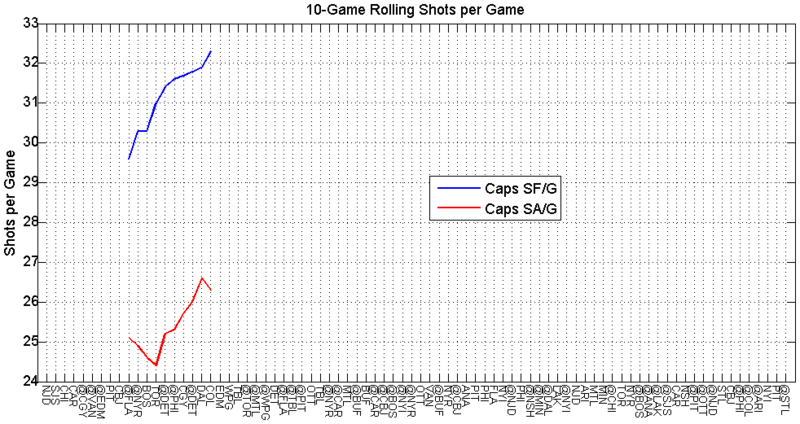 The Caps had the best shot suppression figures in the league. They still are one of the top teams, but they’re number 2 now, bested by Carolina (wut?). 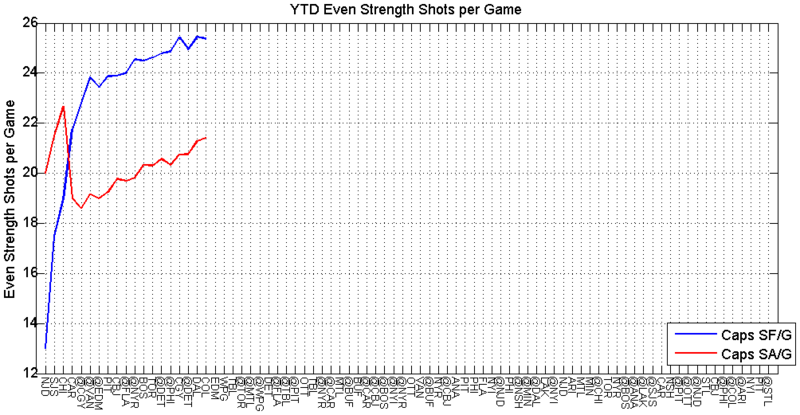 The silver lining is that at least they’re maintaining a very healthy shot differential. 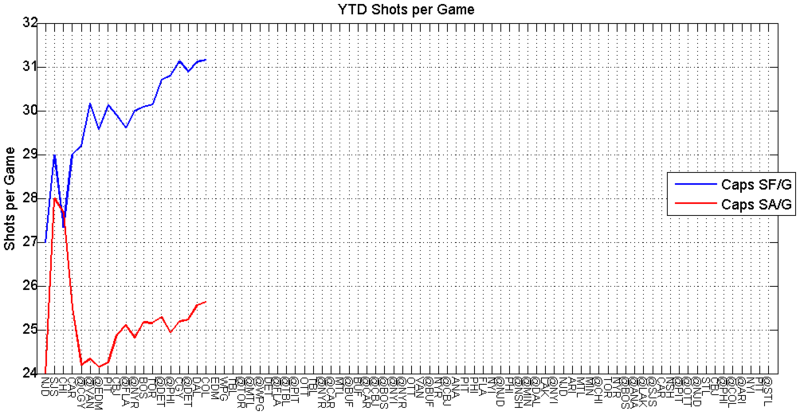 While the shots against spiked up, the shots for did as well. 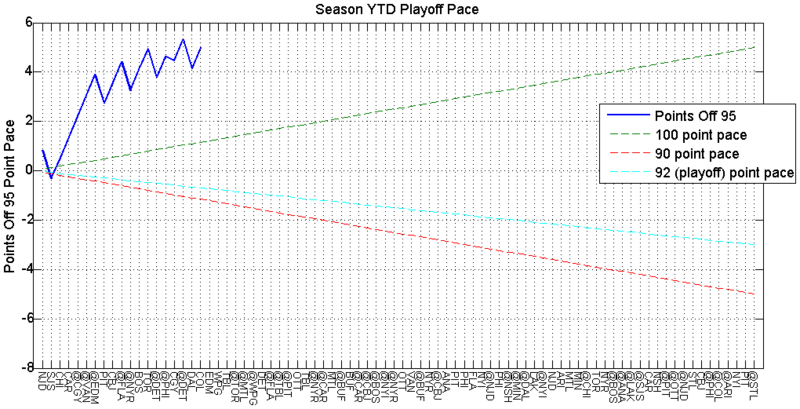 A team that manages ~5 more shots per game over their opponent should definitely find themselves in the playoffs. And that’s all we care about right now. Anything grander than that goal would be putting the cart before the horse right now. 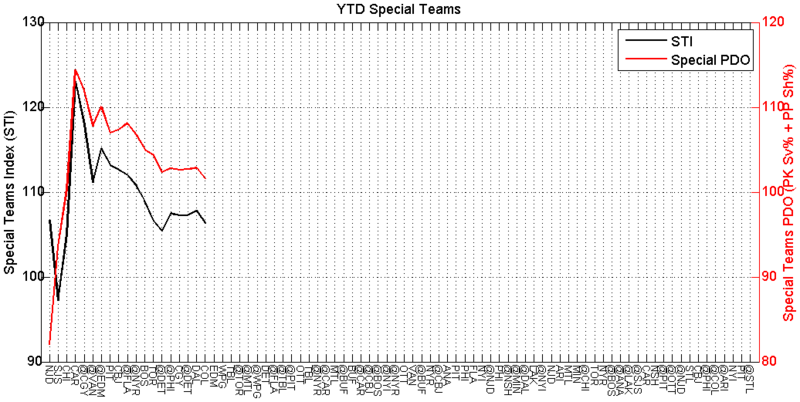 The Caps were looking pretty unfortunate over their 10 games leading up to the Dallas game, but since then, they’ve been the recipients of a few good bounces. I can recall a few instances (maybe only 1) where iron saved the Caps from relinquishing another goal. I still fully expect better from Holtby. There’s nothing wrong with what he’s posted so far, but he’s better than this. You don’t get your name into the elite goaltender discussion on accident. The offense for the Caps has me a little less optimistic. 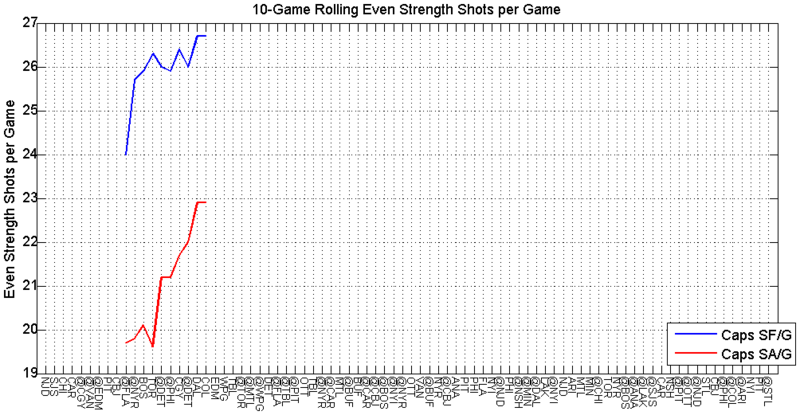 Their ratio of high danger scoring chances to shots on goal has seemed to dip. 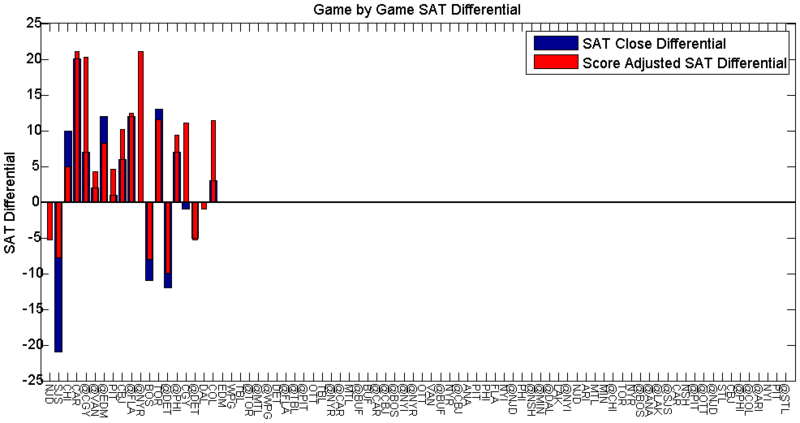 Even if they are hitting a lot of goalposts and having goals overturned, I’d like to see more legitimate scoring chances. Yep. The Caps power play has not seemed very powerful. 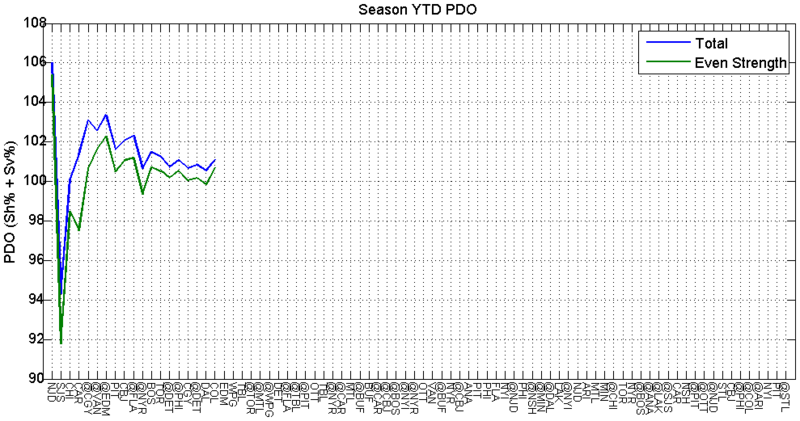 I had high hopes for this year’s variation with Oshie in the slot, but they’ve barely been sputtering along. 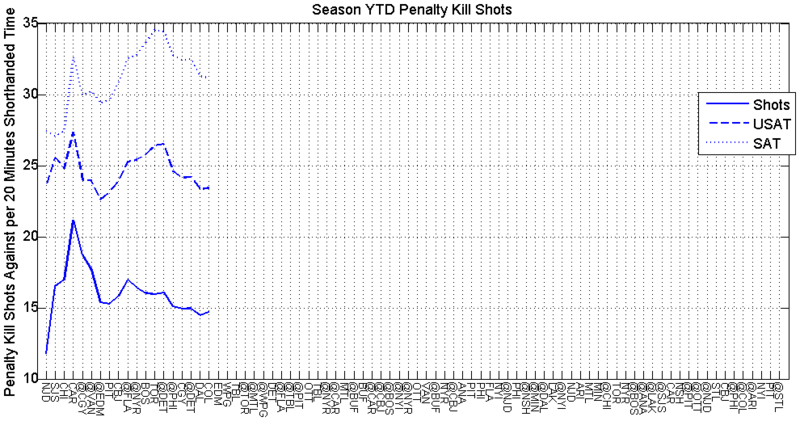 They’re getting their chances and drawing enough penalties, but they’re not shooting very efficiently. 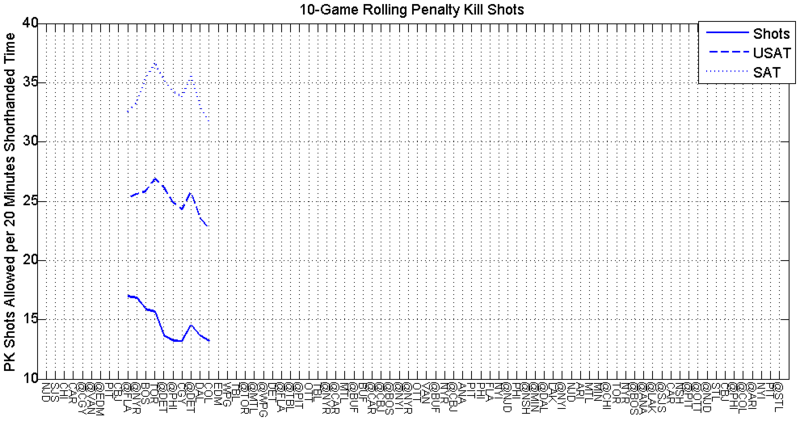 I would like to see more shots in general, but that doesn’t seem to be fluctuating too much one way or the other, they’re just not finding the back of the net. Carlson and Ovi need to put in some reps on that feed. It’s just not working. 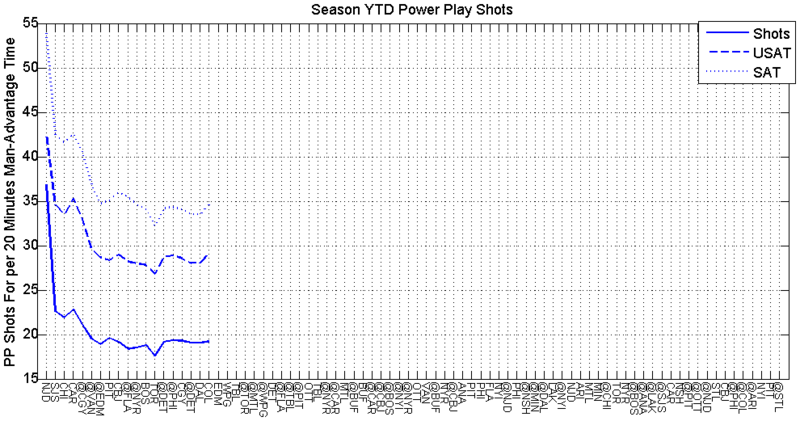 Ovechkin with 1 power play goal in 19 games is not something I would have imagined in any scenario. There’s not much to dislike here. 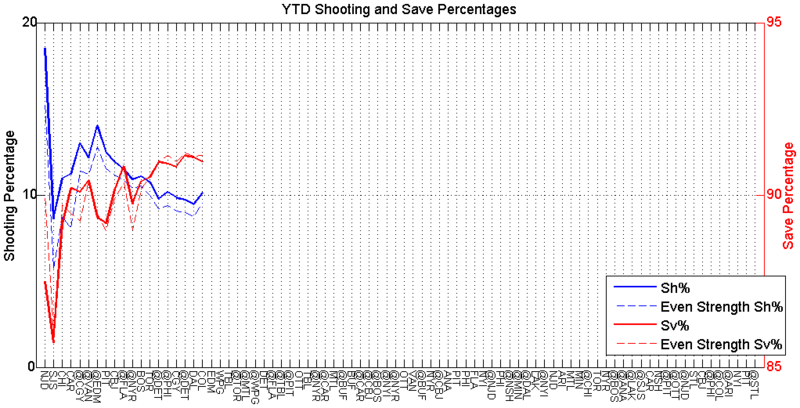 The Caps’ PK unit has been keeping shots down, and they’ve been staying out of the box. 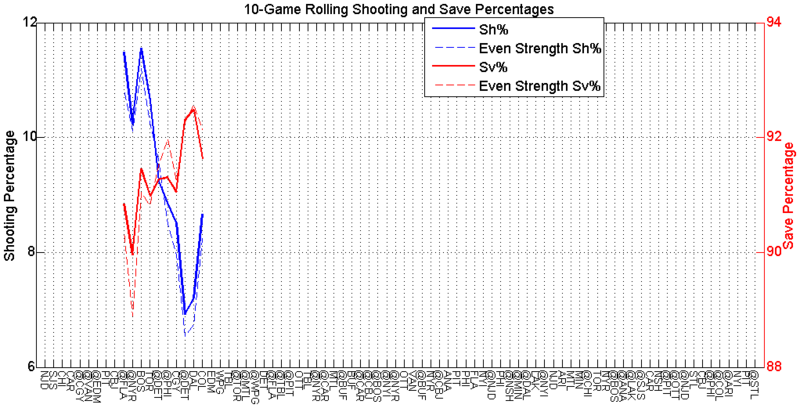 Even with the dip in save percentage in the rolling data (an artifact of the small sample size of PK opportunities – seriously look at that green line dive), the PK is definitely something I’ve been pleased with. Now if only they could keep this up, while righting the power play. Everything would be sunshine and roses. This is still a very good hockey team. The power play should be fixable. Ovechkin will start to put some in the net while up a man. 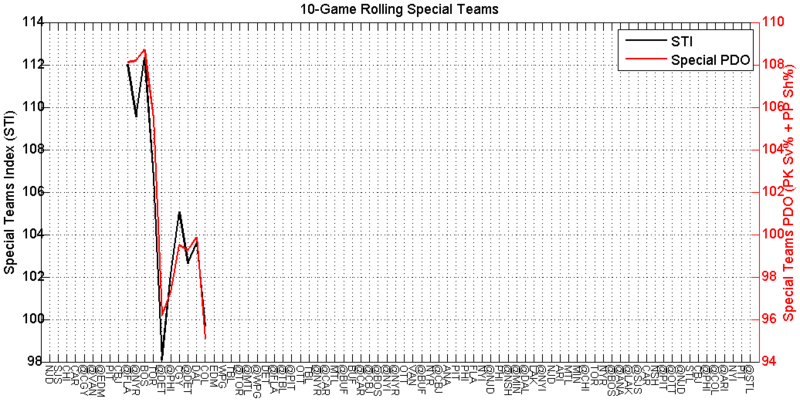 The team has managed to avoid some of their older troubling habits, and they haven’t been turtling when leading (granted – they haven’t been leading much in their recent games). However, they’ve allowed their slow start habit to persist. 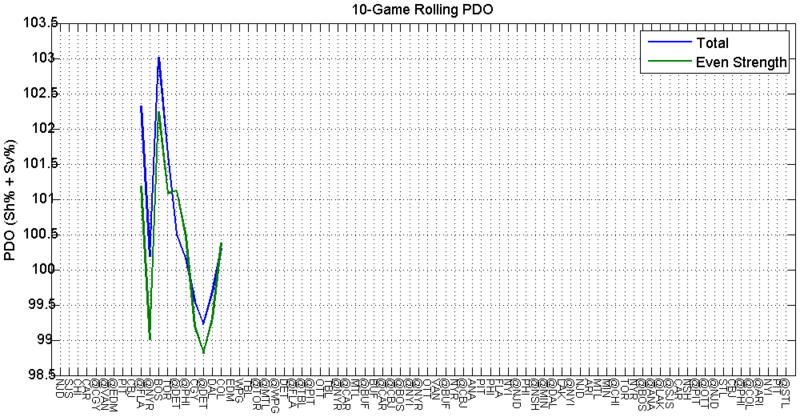 Hopefully, last night’s game is an omen of that pattern reversing. It’s almost Thanksgiving, and the Caps are firmly in playoff position. That’s a good position to be in, historically speaking.